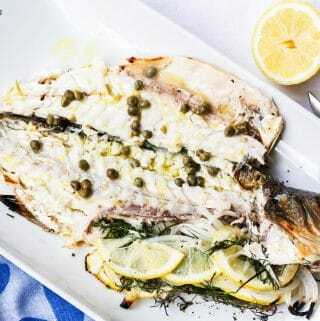 This grilled whole branzino with lemon caper sauce is an easy 15-minute grilled whole fish recipe. 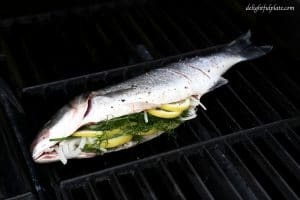 I will also share all the tips I know to cook whole fish on the grill and serve it on the table. 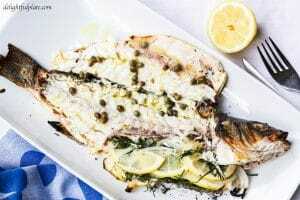 I’m so excited to share this grilled whole branzino recipe. I can’t remember how many times I have made it and I’m sure I will continue making it frequently. 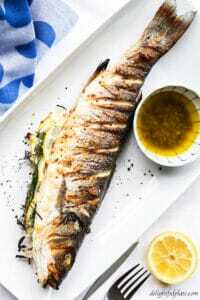 Grilled whole branzino made at home is absolutely delicious without a high price tag. It looks impressive, the skin is crispy and the inside is juicy. 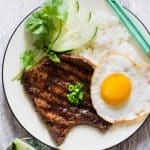 Restaurants usually charge at least $30 and why paying that when it is so fast (15 minutes) and easy to cook at home? I used to think grilling whole fish (and serving it afterward) was intimidating and it could be messy in so many ways. I was scared that it would stick to the grill and fall apart. Moreover, I didn’t know how to cut and serve it so that it still looked appetizing. That fear has been long gone and I seriously need to thank two people for that. Prep the grill really well: clean and oil the grates well (small trick: use your tongs to grab a piece of paper towel and dip it into oil, then rub the grates with it – rub twice if you can). Maintain the heat: grill at medium high heat. Know when to flip: don’t flip the fish too early or it will stick to the grates. When it has released itself from the grill, it’s time to flip. Those tips will guarantee you a great result every single time. Now, let’s talk about how to serve it. Two years ago, we had lunch at a Greek restaurant called Poseidon in Miami and guess what we ordered? 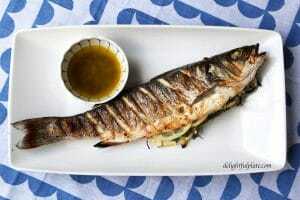 Yes, grilled whole branzino. The server brought the beautifully grilled fish which smelled amazing to our table and he was so kind that he showed us step-by-step how to serve it. Use a sharp knife to cut along both sides of the fish to separate the top fillet from the fin bones. Cut along where the top fillet meets the head and collar bones to separate it from the head and collar bones. Cut to separate the top fillet from the tail. Slide the knife blade between the top fillet and the spine and then flip the top fillet to the other side. Lift the spine and separate it from the bottom fillet. That’s it. It may sound complicated but it’s really easy. Don’t let any fear preventing you from grilling whole fish yourself. Many types of whole fish are excellent for grilling, such as branzino, opah, red snapper, and trout. If you don’t have an outdoor grill, you can broil it in the oven. 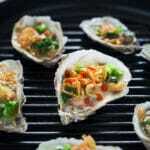 Preheat the grill, clean and oil the grates well, prepare it for medium-high heat. 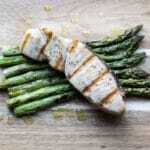 Prep the fish while the grill is preheating. Wash the fish and pat dry (I usually have my fishmonger scale and gut the fish). Score both sides of the fish. Massage it with 1/2 tablespoon of olive oil and sprinkle both the outside and the cavity of the fish generously with salt and pepper. Cut lemon and onion into thin slices. Stuff lemon slices, onion slices, and dill into the cavity of the fish. When the grill is ready (remember it needs to be hot), place the fish on the grill and let it cook for 5-6 minutes. When the fish no longer sticks to the grates, it's time to flip. Use a spatula to slide under the fish and together with a pair of tongs, flip it. Cook for another 5 minutes (amount of time depends on how big your fish is). When the fish is fully cooked, transfer to a serving plate and follow the steps I mentioned earlier to cut it. Drizzle lemon caper sauce over it and enjoy. 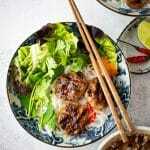 While the fish is cooking, put all ingredients to make the sauce into a bowl and mix well to combine. If you don't have fresh herbs on hand, you can sprinkle dried Italian herbs generously into the cavity of the branzino.